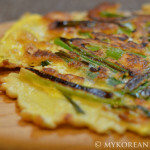 It’s been a while since we had pajeon (literally “green onion pancake”) since our California days with unlimited makgeolli (fermented rice wine) from our local Korean market. 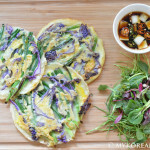 But for the sake of adding to our recipe list, we decided to make a heartier version called haemul pajeon (seafood pancake) tonight for a quick and easy late night snack. 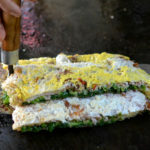 There are endless variations of this dish by simply adding or omitting certain ingredients but the most common are the two aforementioned types. 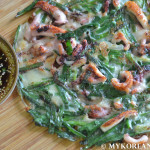 Just thinking about pajeon conjures up many late night drinking sessions back in Seoul. There were some great places that made this using fresh seafood and it was unbelievably delicious. Thick and crispy and perfect on rainy days. I’ve tried to replicate it but to no avail. 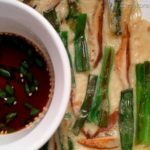 This dish is also referred to as anju (side dish accompanied with alcohol) which is very popular in Korean restaurants and traditional bars. 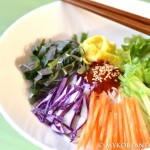 The recipe below includes a basic dipping sauce that can be made in minutes. Mix all ingredients (minus the dipping sauce) together in a mixing bowl until a thick batter mixture is created. It should be similar thickness as regular pancakes. Meanwhile, mix the ingredients for the dipping sauce and set aside. *Purchasing fresh seafood is a good option for serious seafood lovers. However, it will require more time and energy cleaning them (and sometimes gutting them) so I advise buying ready-made frozen seafood carried by most grocery stores.